Master your Gmail inbox with this very short training and never miss an important email anymore. Here are five pro tips for the perfect gmail inbox. Watch the training video for an overview, and dive in with the details below when you are ready to conquer. The list of inbox types includes important first, unread first, starred first and priority inbox. I am showcasing my favorite option but your workflow may be different. With this option enabled, instead of leaving your outbox right away, the message you just sent will hang around for 5-30 seconds while you make up your mind. This allows me to disguise my stupidity on a daily basis. Don’t take a selfie with your webcam at 10pm under fluorescent light. Go for a vacation photo where you are relaxed and possibly even smiling. Research backs up the little yellow face. Emoticons will make you appear more competent and friendly, they create a happier workplace, and they correlate with real-life happiness (read more benefits on Buffer Social). What more do you need 😉 ? 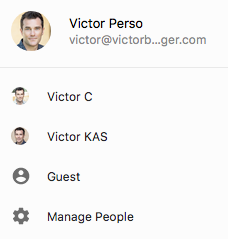 To switch between work and personal accounts, click in the top right corner of your browser. Google Chrome Help has more detailed instructions on how to add a profile. I typically open each account into a different window and recently I have learned to put each account on a different desktop to avoid interferences. I also like to change themes between my accounts (Settings > Themes). This gives me instant visual clues on which account I am looking at. The list of email addresses under Contacts > Others contains all the emails that get automatically collected when you respond to an email. You will want to clean that list. When I do my contacts spring clean up, I also take a little time to add missing information (names, phone numbers, place of work) to existing contacts. Use and re-use those tips and share new ones with us in the comments section below!